There’s a rising tide of debt in the United States that’s threatening to erode the financial stability and promise of a bright future for tens of millions of Americans, middle-class Americans, as well as generations to come. However, it’s not another Mortgage Meltdown and real estate crash we have to be wary of, nor is it mounting credit card debt, unpaid medical debt, or record auto loans (although those latter three are concerning). Instead, it’s student loans that are fundamentally changing the economic landscape and financially crippling Millennials and younger generations. Per the latest statistics, the total student loan (education) debt in the U.S. now sits at $1.52 trillion – the first time it’s ever eclipsed $1.5 million. There are 44.7 million students or former students with unpaid student loan balances – or nearly 12% of the entire U.S. population. That also represents a record high – both in the total amount of student loans and in the number of borrowers – for the 19th straight year! The average student loan debt is now $32,731 per borrower, but the current graduating classes average $37,172 in student loan debt – a number that’s rising every year. 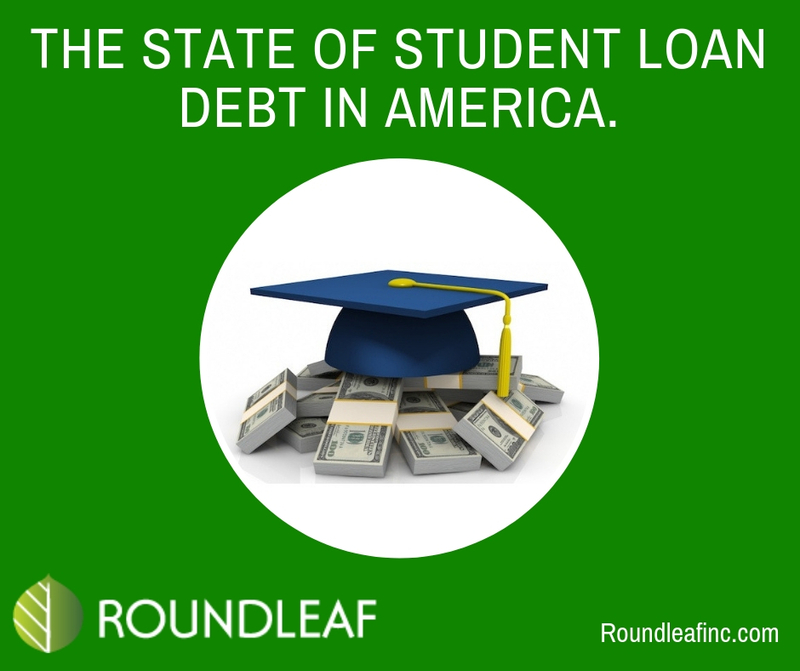 According to the Federal Reserve, student loan debt has risen by 20% just from 2015-16! If we look at the number of people who owe certain amounts, we find some pretty scary data. For instance, the majority of borrowers (12.2 million) owe between $10,000 and $25,000 of student loans. However, 8.6 million owe $25,000 to $50,000, 2 million owe between $75,000 and $150,000, and 1.2 million people owe $150,000 or more! This is also a far cry from our student loan levels in recent past. Just 15 years ago in 2004, we “only” carried $346 billion in student loans. But that figure increase by more than 300% by 2017. Likewise, the Federal Reserve Bank estimates that every generation’s average student loan balance has increased by 256% over the last decade. If we look at student loan borrowers by age bracket, we also see some interesting – and unexpected – trends. As expected, people under 30 make up the largest demographic of student loan borrowers – about 40% of all debt-holders. In the last 15 years, that group’s numbers have more than doubled! Also predictable, the second largest group is students and post-grads in their 30s, who make up 27% of all student loan borrowers. But you may be surprised to hear that borrowers in their 40s and 50s make up about 27% of all student loan holders – more than 1 in every 4. Even more shocking is that borrowers who are age 60 or older make up a significant 6% of all borrowers, and that number has risen by 1,256% percent in the last decade! Not only is the amount of debt we take on to fund education alarming, but so is the fact that we find it even more difficult to pay them off. To wit, only an estimated 16.7 million of the 44.2 million student loan borrowers pay regularly and lower their loan balances. For many of us, our student loan payments are actually increasing over time due to interest charges, even as we make monthly payments. For instance, in 2015, 46% of all borrowers – nearly 1 out of ever 2 – had the same or even higher balance as the previous quarter! To be clear, I’m not referring to taking out new loans to add to the balance, but the accumulated interest that drives up the balance on their existing loans, even as they pay. Currently, more than 10% of all student loans (10.7%) are in default – defined as 90 days late or more. In fact, student loan debt now has the highest 90-day+ delinquency rate of all household debt (more than delinquent mortgages, credit cards, auto loans, etc.). While student loans have a 10%+ delinquency rate, home loan delinquencies (1.1%) and auto loan delinquencies (4%) lag far behind. The level of defaults has quadrupled in the 15-year period since 2004 (but remember that the number of borrowers doubled in that time, too). Student loans are the only type of debt that’s grown continuously since the Great Recession. Since the height of the Great Recession, student loans have climbed 157%, while auto loan debt grew by “only” 52% and credit card debt has actually fallen by 1%. The prevalence of student loans among Millennials, younger generations, and 30-somethings is actually holding them back from buying homes, contributing to a paltry 64% homeownership rate. In fact, 16% of all young workers ages 25 to 35 still lives with their parents, which is up 4% even from the height of the Great Recession. Roundleaf, Inc. can help you with your debt dilemma. If you’re facing significant debt balances but having a difficult time keeping up, contact us to learn about your debt relief options. Relief is on the way with Roundleaf, Inc!